greetings from the warm Sonoran desert this Monday afternoon! I hope all are well, wherever you call home on this special celestial day. If you were fortunate enough to be in, or close to the path of coomplete darkness, then lucky for you! Here in Southern Arizona we only a 60% eclipse, so it just looked like we were just wearing a light shade of sunglasses for about an hour. It was nice to see so many people interested and distracted, at least for a little while, from all the ugliness and divisiveness that has dominated the national scene lately. As for me, I enjoy the natural beauty this planet offers and anything having to do with the stars, moon, and sky! After dealing with a lung infection the last couple of weeks, I finally feel much better. My grandson Isaiah was here for a week and we had a great time, despite my lingering cough. 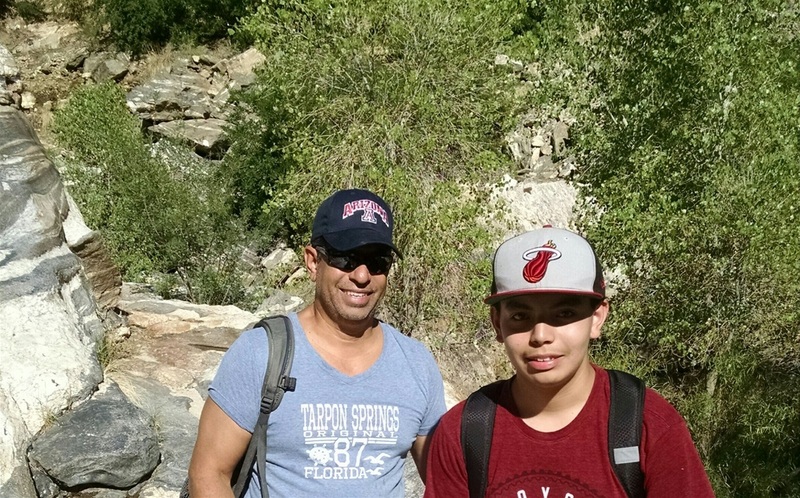 Speaking of natural beauty, I took him to a local water spot here in Tucson called Sabino Canyon. It is a mountain creek that runs in the spring with snow melt and now in the summer, with all the recent summer monsoonal rains. Isaiah was not too keen on jumping into a 20 foot deep pool of water, despite watching his granfather, me, dive in off the boulders like an olympic medalist! We enjoyed our time together and were already planning next years visit, hoping we can convince his parents for a two week stay. Now that I'm healthier and Isaiah is back home, I can refocus and catch up on my writings again. I'm just seven states away from completing the first edition, then plan to send it off to the proof reading lady, Mary Anne, then I will start the next 25 states in October. It has been a challenge at times, finding the time and energy to sit behind this computer, but once I do, it all comes back to me, vividly and enthusiasticly. Well friends, I hope you enjoy the rest of your week, so stay cool and safe.